WALT: group ideas into paragraphs. WALT: Write a recount. Last Wednesday at Pt England School we had a special guest called Paul Martin. Paul Martin was a rugby player for the Chiefs and a comic artist. 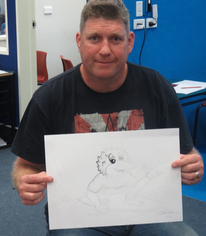 He showed us how to make comic books and draw kiwis. When he came to our class he told us the basics of how to draw people in the front, on the side and the back. My favourite thing was learning all the basics of drawing a person.